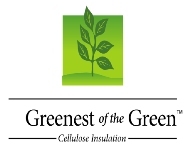 Cellulose insulation is the greenest choice to insulate your home. Offering the greatest energy savings, the highest recycled content and the lowest embodied energy (amount of energy required to manufacture) of any insulation product. Our products are not only a great choice, but the greenest choice, too.